Ashkenazi: a member of one of the two great divisions of Jews comprising the eastern European Yiddish-speaking Jews. VS. Sephardic. B'rith: B'nai B'rith: an international Jewish organization, founded in New York City in 1843, which institutes and administers programs designed to promote the social, educational, and cultural betterment of Jews and of the public at large. Hasidic: a member of a sect founded in Poland in the 18th century and characterized by its emphasis on mysticism, prayer, ritual strictness, religious zeal, and joy. Sephardic: Jews of Spain and Portugal or their descendants; after expulsion from Spain and Portugal in 1492, established communities in North Africa, the Balkans, Western Europe, and elsewhere. 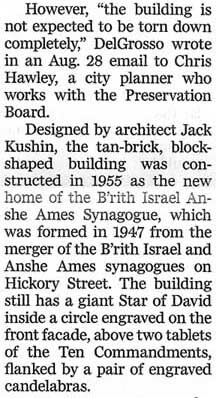 The B'rith Israel Anshe Ames Synagogue came into existence as a result of a merger of the B'rith Israel Synagogue or the Hickory Street Shul (destroyed) and the Anshe Ames Synagogue also of Hickory Street (destroyed) in 1947. The first permanent synagogue built by Jewish immigrants to the city in the 1880s, B'rith Israel Synagogue also functioned as the first Hasidic synagogue in the city. Although gatherings of people had occurred earlier, the congregation is recognized as being organized on 13 February, 1887. It was organized primarily to serve the Hasidic Russian Jewry who would not worship with the Lithuanians. Originally worshiping at 160 Lutheran Alley, the congregation later purchased sites on Mortimer and Hickory Streets. During the Panic of 1893, they experienced a decrease in members and sold their Mortimer Street property. In 1898, they constructed a modest building at 209 Hickory, north of William, remaining here until the 1912 completion,of a new 800 seat house of worship at 177 Hickory. At the time of the move, they sold their old building to the Anshe Ames Congregation. The Congregation Anshe Ames is recognized as being a small one. With the purchase of their own building in 1912, they constantly struggled to remain afloat. They experienced their peak period in the early 1930s when a rabbi, known for his sermons, lead the congregation. Both congregations remained at their Hickory Street locations until the early 1940s. By then, the Jewish East Side had passed into history. The congregation of B'rith Israel was the first to move. They relocated to a converted apartment at 1191 Hertel Avenue, being joined by members of Anshe Ames in 1947. Having outgrown their small rented quarters in the early 1950s they began planning for the building at 1237 Hertel. They broke ground in 1953, and in January, 1954 moved, into the basement of their partially completed house of worship. Finished at a cost of $80.000, they formally dedicated their 390 seat building during services on 30 August, 1954. A 63-year-old former North Buffalo synagogue that is now home to a church is poised to get a new life, as a Clarence developer seeks to put nine new luxury apartments and retail space into the longtime religious building. Rocco J. DelGrosso wants to transform the Faith of the Good Shepherd Chapel at 1235-1237 Hertel Avenue into the newest residential address along the fast-growing commercial strip. He's currently in the process of buying the property from the church for $185,000, pending the congregation's move to a new location, and hopes to start his conversion effort by mid-March. However, the current design of the building presents some accessibility challenges, because the sanctuary level is six to seven feet above street level, while the lower floor is a similar height below ground. So plans for the $1.5 million project call for reconfiguring the interior of the two-story building with four units on each floor, while removing the front entrance and steps on Hertel. DelGrosso then intends to construct a front addition extending to the sidewalk on Hertel that would include two retail spaces on the first floor along the street, plus a large two-bedroom apartment on the second floor along the length of the building, complete with Juliet balconies. The developer and his architect, David Giusiana, also designed a combined entryway on the far eastern end of the addition, providing access to both a retail storefront and a stairwell lift or elevator that would take people to the lower level. Meanwhile, the upper level will be accessible from a stairway leading from the new covered and secured parking garage that is also being constructed as part of the project, with nine parking spaces. Car traffic would enter the garage from Hertel and exit through the rear onto Hertel Alley, which runs between Commonwealth and Traymore. "I love doing things that really test my abilities and test my design skills," DelGrosso said. "What some might look at as a disadvantage of the split entry, we found for our design to be advantageous and to work quite well." The larger upper-floor units will be constructed in the tall sanctuary space, with two bedrooms and a loft level in each. Each apartment will also have large windows that provide significant daylight from the east or west, creating what DelGross calls "sunrise" and "sunset" units. The lower-level units will be one-bedroom apartments with large daylight windows at the street level. All apartments will have in-unit laundry and workspace. DelGrosso also plans an outdoor sundeck and patio for tenants. "It's going to be a really, really pretty project," he said. Specific details of apartment sizes and rents are still in flux but "the important thing to me is that it looks absolutely consistent with the Hertel Avenue district," DelGross said. The design features red brick, old sandstone and clapboard siding, as "we'd like it to look a little bit older like some of the buildings on Hertel do." He is seeking a variance from the Zoning Board of Appeals on Dec. 20. The project will come to the Planning Board for approval at a later date. Once work starts in the spring, beginning with asbestos remediation, DelGrosso hopes to finish by middle or late fall of next year. DelGrosso said there are no stained-glass windows remaining, although there are rose-colored or tinted glass panes that he does not believe are original to the structure. But the building still has a giant Star of David inside a circle engraved on the front facade, above two tablets of the Ten Commandments, flanked by a pair of engraved candelabras. The developer said he hopes to remove those "beautiful stone engravings" and donate them to an active local synagogue. "We don't want to just cover them over," he said. "We're hoping someone will step up."